Want to get a bird’s eye view of your surroundings? Want to make awesome videos of the world, or record some extreme sport? Or maybe you just want to take your selfies to the next level. Then you need a video drone. here are top 5 of the best drones capable of 4K video for late 2016-early 2017. 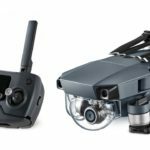 All of them on this list are reasonably compact and portable, from the Tiny Yuneec Breeze to the collapsible DJI Mavic Pro. I couldn’t use GoPro Karma video 🙁 otherwise it would have been in this list.